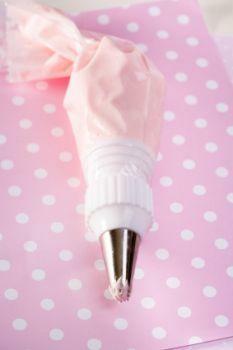 A cake decorating tip caddy is one of the most essential supplies for amateur and professional cake decorators. It's a tidy, organized place to store frosting tips and other equipment, and it makes it simple to find the tips and supplies you need when you're in the midst of decorating. If you're just starting to decorate cakes and experiment with different frostings, a tip caddy can still be useful, but you may want to hold off on buying one until you've had the opportunity to try out a lot of different tips and frosting techniques. One huge advantage of a cake decorating tip caddy is that it makes transportation of decorating supplies very convenient. If you need to frost a cake but can't do it in your kitchen, the caddy will let you easily bring all of your frosting tips and piping bags to the location where you can decorate. A caddy just for tips is small enough to bring almost anywhere, so you can take it with you whether you're adding the finishing touches to a wedding cake at a church or heading to your best friend's house to help frost cupcakes for a child's birthday party. Most caddies for cake decorators include storage space for equipment other than tips. The top level of the caddy is often reserved for the tips and has a series of small plastic spikes that keep the tips in place. Open space and lower compartments in the caddy can be used to store piping bags, gel coloring for frosting, glitter, dragées, and other supplies. If you can't find a caddy that's specially designed to hold frosting tips, a general cake decorating caddy or another type of storage box can work nearly as well. Even a clean, unused jewelry box has enough separate compartments and storage spaces to hold tips and a variety of other cake decorating supplies. A caddy can be tough to find, so be willing to check several different places to see if they have something that will suit your needs. Craft stores such as Michael's and Jo-Ann Fabric often carry cake decorating supplies, and big retailers such as Wal-Mart and Target sell caddy-like storage containers that can be used to store frosting tips, even if they're not specifically manufactured for cake decorating. You can also buy tip caddies online. The Wilton Web site has a huge variety of tips for purchase, caddies for storing, and recipes and design patterns to try. If that isn't enough for you, the site offers decorating advice and information about cake classes, too. Wilton products and other caddies are also available for purchase through Amazon. A wide variety of tip caddies are available, so choose the one that fits the supplies you have and the amount of cake decorating you do. The Wilton 50-Piece Tool and Caddy Decorating Set comes with a variety of tips, colorings, and other equipment, and the caddy has ample room to store the supplies you already own. The 101-Piece Tool and Caddy Decorating Set, also from Wilton, has space for even more equipment and is designed with the advanced cake decorator in mind. It comes with tips you may already own, but there's plenty of space for equipment that isn't included. The basic empty Wilton tool caddy has space for 48 frosting tips as well as other supplies. It is a good choice for a baker and decorator who already owns most of the equipment that would come with a beginner's kit.